An inside view of the historic Panj Mandir containing age-old frescoes. A team of the Department of Tourism, headed by District Tourism Officer Balraj Singh, along with technical experts visited historic Panj Mandir at Fatehgarh Churian about 27 kms from Amritsar. The team was impressed with the splendid treasure trove of frescoes on the walls of the temple. “I have never seen such architecture in the region and it is surely needed to be preserved,” said Balraj Singh while pointing out that the temple seemed to be more than 150-year-old. The invaluable frescoes have been decaying due to a lack of knowledge among area residents while the lower portion of the walls, which were adorned with priceless frescoes, of the three of the four temples, have been whitewashed by the caretakers of the temple. The temple has a very unique structure and is a blend of various art styles, including Mughal, Hindu and Sikh architecture not found anywhere else in the region. Unique architecture of domes of temple in Fatehgarh Churian near Amritsar. The temple was built during the reign of Sikh ruler Maharaja Ranjit Singh. 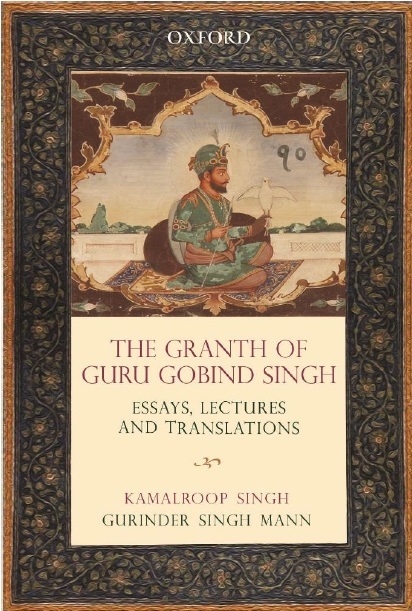 It has been a rich treasure trove of resplendent frescoes of Hindu deities besides Guru Nanak Dev along with his two disciples Bala and Mardana. It comprises four small temples of Lord Vishnu, Shiva, Ganesha and Surya in as many corners with the main temple of lord Krishna and Ram situated at the centre. Balraj Singh said a high-level team from the department visited the temple after getting instructions from Geetika Kallah, Principal Secretary, Tourism. “We were surprised to see the temple as a majority of frescoes has been intact and could be preserved. Only Shiv temple - one of the four temples in the premises situated on a corner – was whitewashed by the owner who was still in possession of the shrine. Remaining frescoes are in very good conditions. 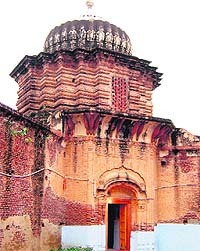 The domes of four temples situated on the four corners of the shrine was also unique in its architecture,” said Balraj. He said he would submit a report regarding the preservation of the temple to higher authorities on Monday. It is to mention here that the plight of the temple was first highlighted in The Tribune on August 1, 2011. Later, a team of Archaeological Survey of India (ASI), Chandigarh circle, visited the shrine and recommended preservation of historical structures and frescoes to the ASI authorities in New Delhi. The Superintendent Archaeologist, Chandigarh Circle, had submitted a report of the Director General, ASI, New Delhi, while strongly recommending its protection and preservation keeping in view its unique art and architecture. “In the report, the ASI had said that the temple reflects the regional artistic style and temperament of the 18th century. It is an effective amalgamation of Mughal and Sikh architecture with artistic inputs of the Pahari miniatures,” said an official of Chandigarh circle of the ASI. A team of Cultural Affairs, Archaeology and Museums, Punjab, had also visited the historic temple. Rajneesh Khosla, who is known for preservation of handwritten manuscripts and has taken up the issue of its preservation with the authorities concerned, expressed his hope that the historic temple would now be preserved and become a major tourist destination.